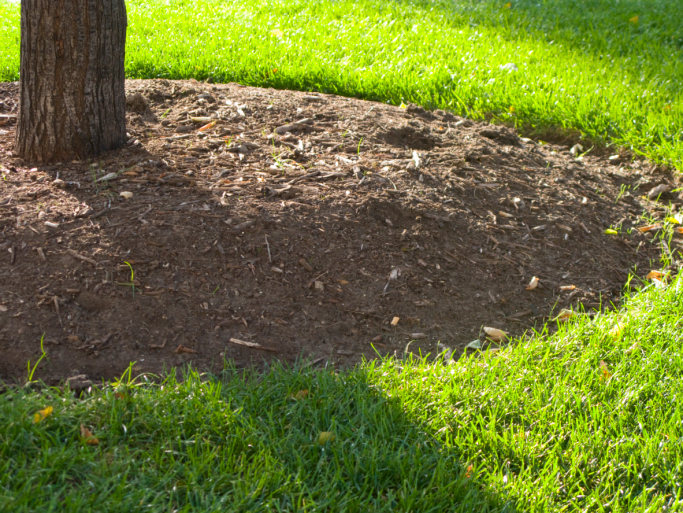 Compacted soil can be a hindrance to proper tree growth. When we water trees, there is something uniquely satisfying about watching the water seep into the soil. But most people don’t realize what’s happening inside the soil and under the surface. A lot of trees suffer from a problem that is hard to see with the naked eye. Compacted soil is a problem that can prevent your current trees from growing healthily, as well as make it harder for newly planted trees to develop properly. But you can use some remedies to treat compacted soil after having your soil tested to diagnose the problem. Compacted soil is what occurs when soil is weighted down by foot traffic or heavy equipment such as lawnmowers. They pack the particles of soil closer together. When trees are afflicted with compacted soil, it is more difficult for water and nutrients to flow through to the tree roots. The lack of water, nutrients, and limited air flow make it harder for the tree to grow. To check whether your tree’s soil is compacted, grab a screwdriver and try to push it down into the soil. If it is hard to push it down, that means you have compacted soil. Also, you can cut out a chunk of it – soil that has been compacted will look dry, dull, and grayish. If it’s a minor problem, it can possibly be fixed by mixing compost into the top 8 to 10 inches of soil and creating a mulch ring around the tree. You can also add earthworms as they eat through compacted soil, which can help restore a normal balance in the flow of air and water to the tree. If the problem is more serious, you may need to have a professional come out to take care of it. Aeration and vertical mulching are two techniques that could be recommended in these cases to help restore the health of your soil and trees. Call Nelson Tree Specialist for Specialty Tree Services. We are experts and want to work with you to provide the best care for your trees. After we’re done, your trees will be thriving and safe as they beautify your landscape. Contact us today for your free quote. We will respond in a timely manner. If you need us, we’re available for emergency services 24/7. No task is too much to ask. Nelson Tree Specialist is a member of the International Society of Arboriculture, and they have dubbed us a certified arborist. We’re also an accredited business as declared by the Better Business Bureau, and highly reviewed on Angie’s List. Follow our blog for weekly updates regarding tree services. And don’t forget to follow us on Facebook and Twitter. Remember: our goal is to make sure you are 100% satisfied. This entry was posted on Friday, November 11th, 2016 at 3:51 pm. Both comments and pings are currently closed.